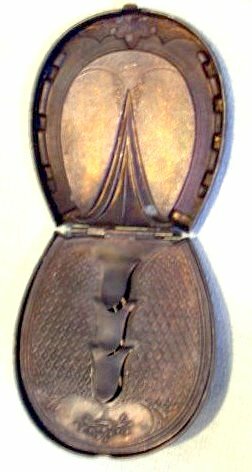 This needle case with button to make needles pop up called the "Quadruple Minerva Lever Casket", was patented by Copestake, Moore, Crampton & Co., London" with the embossed head of Minerva both front and back, 1-1/4" by 2-3/4". I found this needlecase for sale at the Newark Antique & Collectors Fair which I attend regularly but resisted buying it at £120 which is lot of money for something made of base metal. It illustrates just how collectable sewing items have become. The Athena Golden Needle Case by Copestake Moore Crampton & Co Licensees. Gilt metal needle case which opens to reveal compartments. Decoration in relief. Patent 1869. 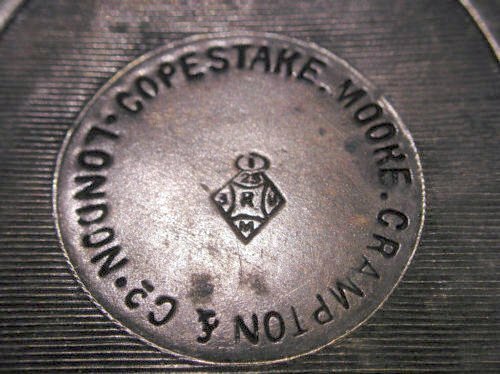 2.75" x 2.25"
I have been trying to find a needlecase marked Copestake, Moore Crampton & Co to add to my collection of George Moore memorabelia but they appear to be as rare as hen's teeth and consequently to command high prices. This summer (2011) one Jean-Pierre Nicolas contacted me from France offering to sell a "perfect" Quadruple lever Minerva casket in a leather pouch and we agreed a price for the item. Sadly, on taking delivery I found to my huge disappointment that it was just the outer shell, devoid of its mechanism. After some re-negotiation, I retained the incomplete item at a cost of just a few Euros. I imagine it has little worth as a collectable without any innards but, at least, it has the name of George Moore's firm embossed on both sides. I wonder if the pouch is original to the item or a later marriage? It certainly fits like a glove! Anybody know? My search for a truly perfect and complete mechanical needlecase from Copestake, Moore Crampton & Co continues! I have just acquired (Sept 2011) this needlecase in the shape of a horseshoe at a cost of around £50 from ebay seller, Shirley Howard. Whilst I have seen needlecases of this design by Avery before, I have never seen one stamped with Copestake Moore Crampton & Co London. I think it dates to around 1876, the year of George Moore's death and it is possibly quite a rare find. Can any needlecase specialist collector out there tell me more about it? 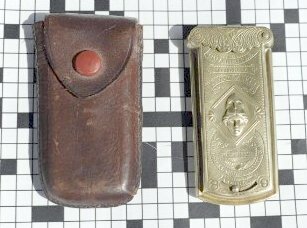 The photographs to the left show front and back views of this novelty brass needlecase. The photograph to the right shows the needlecase open revealing three little clips designed to retain the needles. The part bearing the three clips is also hinged and lifts to reveal a storage compartment beneath, possibly for pins or similar. The piece measures 65mm by 59 mm at its widest points. As you can see from the pictures the item has a lovely patina which, I think, would be spoilt by over zealous cleaning. 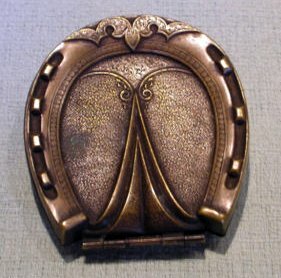 It is brass and measures 1.3/4" long and 3/4" wide. The front is decorated with a lady's head and the back is marked "The Minerva Needle Case Copestake Moore Crampton & Co Patent No 3517 Sharps". The edge is decorated and stamped 9. The top has a tight clip fastening. The top lifts and the inside section slides slightly forward to extend the needles. Inside there is an original paper needle case marked Sharps 9. There are no longer any needles in it. This lovely little piece is in perfect original condition.